Sigali Landau, Rule Britannia, 2005. 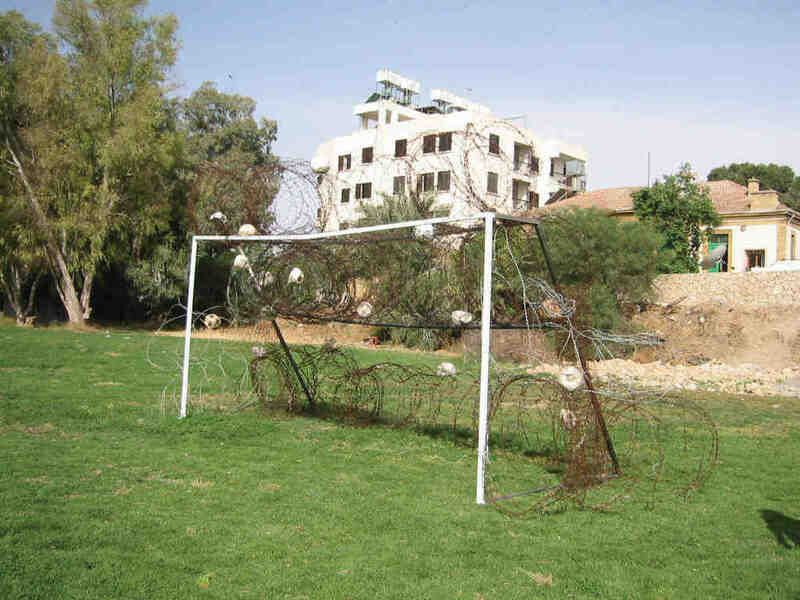 Installation with goal posts, barbed wire and old footballs. Courtesy of the artist. Location was everything in the international exhibition Leaps of Faith, which took place in and around the United Nations buffer zone separating Cyprus’s Greek south from its Turkish north. Walking through checkpoints to view various works — and receiving a visa stamp with each visit — the show proved a compelling example of art directly taking on a geopolitical quandary. As the last divided capital city in Europe, Old Nicosia straddles the so-called “green line” where UN soldiers stand guard twenty-four hours a day. The first crossing point was opened in April 2003, allowing the two sides to interact with each other for the first time since 1974. At issue is resolving a three-decade hangover on the issue of occupation, borders, sovereignty and what constitutes Cypriot nationality. The Cyprus dilemma is of growing political importance to the US and the rest of western Europe, given its proximity to Iraq, Iran, Lebanon and Syria. Illuminating such complexities, Leaps of Faith was an unprecedented exhibition, conceived by the political scientist Rana Zancir and curated by Katerina Gregos (Athens) and Erden Kosova (Istanbul). Twenty artists were commissioned to produce site-specific works, public interventions and storefront satellite projects; overall, the work expressed the very thing that has eluded bureaucrats from both sides of the fence — that coexistence is possible and doable. One of the exhibition’s strengths lay in its use of documentary to convey what life is like in a region that arguably feels more Middle Eastern than European. Cypriot Katerina Attalides simply installed rows of unframed photos with captions articulating the opinions of a cross section of local denizens, from immigrant laborers to soldiers. Phil Collins took an alternative approach: Rather than photographing Cypriots or photogenic, bombed out architecture, he shot details of post-it notes and napkin doodles pinned to the message board of a Turkish café. Bringing to life a green line tradition, Collins included the dates and cities of birth, nicknames, profession and seasons fulfilled by decommissioned soldiers, giving form to faceless individuals who collectively fought off ennui and the droll repetition of guard duty. A split-screen video projection by the Finnish artists Minna Rainio and Mark Roberts featured the picturesque landscape at the border of Finland and Russia moving through the four seasons. Narrated by older locals from both countries, the work brought to light the propaganda and paranoia that existed on both sides. Strong cinematography added a poetic melancholy to the anecdotal voice-overs. Particularly striking was how materially and culturally rich the Finnish appeared next to the Russians, despite their close proximity. Parallels can be drawn with the current Cypriot economic situation — the contrast between the poorer north and the more affluent south, each with its own currency. Ironically, Greek Cypriots have been known to cross the border to shop for cheap goods, adding a perverse twist to their contentious debate. 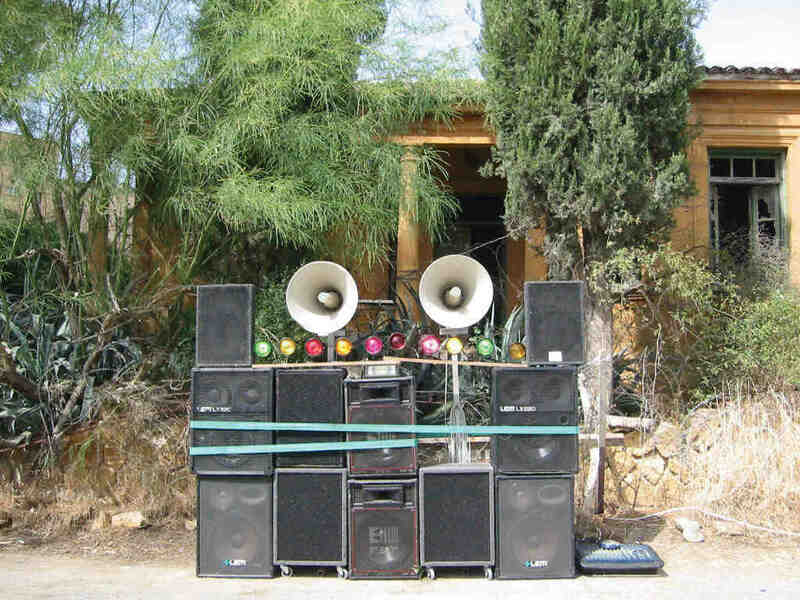 Tel Aviv-based multimedia artist Sigilit Landau is no stranger to contested territories. Her visceral video, a documentation of a performance in which she uses barbed wire in place of a hula-hoop, pulls no punches. Close-ups reveal the pockmarks and welts left on her naked flesh as she moved her hips round and round on the shores of the Mediterranean. Using the dialectics of contemporary art discourse to hit the sensitive spots in the Cyprus conundrum, Leaps of Faith high-lighted a novel means of reconciliation, even reunification. Mexican artist Minerva Cuervas’s hypothetical map of a reunified Cyprus circa 2017 was unequivocal. Fusing the logos of both municipalities (a definite no-no for the authorities), she created a fictitious wholeness missing from the present day. Mark Bijl’s stickers, affixed to lamp posts, doors and just about everywhere, proclaimed “Cyprus: One Island Under Self-Control,” as if to mock the obstinate stance of politicians apparently working against the will of the people. It was refreshing to see such installation works — plus additional film/video screenings — spark discussion about a wide range of topics, from immigration to alternative lifestyles. The event as a whole edified its audience without getting bogged down in the dogma or vitriol that politically tends to pervade the country.